If you are a MySQL® DBA and want to learn MongoDB® quickly - this webinar is for you. MySQL and MongoDB shares similar concepts so it will not be hard to get up to speed with MongoDB. In the webinar, each slide will show a MySQL concept or operation (on the left) and the corresponding MongoDB one (on the right). Alexander joined Percona in 2013. Alexander worked with MySQL since 2000 as DBA and Application Developer. 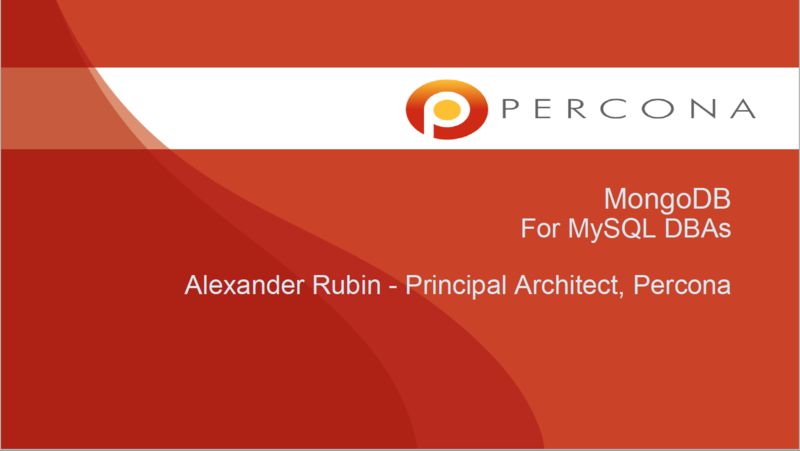 Before joining Percona he was doing MySQL consulting as a principal consultant for over 7 years (started with MySQL AB in 2006, then Sun Microsystems and then Oracle). He helped many customers design large, scalable and highly available MySQL systems and optimize MySQL performance. Alexander also helped customers design Big Data stores with Apache Hadoop and related technologies.